Spa word association game. I’ll go first. Relaxation, heat, water, luxury. How about friendly service, stunning architecture, wonderful product ranges and a great treatment menu? Add to that a carefully thought-through theme, a few personal flourishes and excellent food. 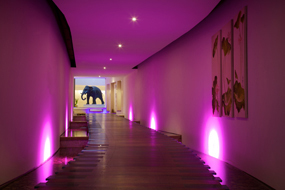 You’re heading towards a picture in your mind of the perfect spa. Am I right? 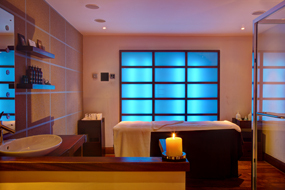 Well that is how great the Serenity Spa at Seaham Hall is… really! But in addition to that the hotel also boasts some very picturesque grounds (including a stunning view of the sea). There are two outdoor hot tubs, a lovely atmosphere and a rather delightful cocktail menu. Heaven! My colleague and I are no strangers to the spa experience, so we know how to appreciate a good one when we see it. All too often, particularly when marketed as exclusive or luxury, the atmosphere can end up feeling a bit unwelcoming – even pretentious. Serenity was absolutely the opposite. The Spa Manager was very proud of Seaham Hall Spa’s offering – and rightly so. She introduced us to her kingdom with good humour and passion for the spa’s healing properties. In fact, great service was a theme throughout the hotel – staff were smiling, happy and genuinely chatty. We got the impression it’s a great place to work. The treatment menu is sumptuous, well balanced and reflects Seaham’s commitment to offering a wonderful, tranquil eastern inspired experience for all. We each had a full body massage and facial and our treatments had been individually tailored to our requirements so we had very different experiences. Between us we had the privilege of sampling treatments from all three of their signature ranges Ytsara, Sundari and Ishga. I’m an exhausted mother of a toddler and as such will always take the option that offers maximum relaxation. So my Sundari massage focused on profound relaxation and my Ishga facial repaired the damage of more than a few sleepless nights. Blissful and quiet. My colleague (with more children but also much more resilience than me) took the restorative Ytsara route to stretch muscles and ease joints – more interaction and movement and deeper work to condition the body. Her facial was oily, in a very good way, and rejuvenating. Basically if you can find some time then I suggest you book. Go and have a lovely time. Genuinely kick back and relax. Rave about it afterwards and tell all your friends to go and then you have an excuse to go again. Meet them there by the big elephant. Thanks Seaham Hall Spa. You definitely deserve your place in the UK top 10.